Decorative concrete contractors share many amazing projects with ConcreteNetwork.com throughout the year. We’re always impressed by the ingenuity of their work, as contractors continue to come up with new techniques to overcome unusual design challenges. These projects also serve as a crystal ball, revealing how the decorative concrete industry is evolving in response to consumer demand and current design trends. Based on the projects we've featured over this past year, we're predicting a number of trend-setting looks for decorative concrete in 2015. We hope they spark your imagination and inspire you to set a few trends of your own. How do you breathe new life into an outdated concrete floor while staying true to its original character? More contractors are stepping up to that challenge by polishing the concrete to remove the old and expose the new. This technique works especially well when existing concrete floors must be blended with newly placed floors (see Polished Floors Revitalize a Mid-Century Home) or when a floor needs to be restored to serve a new purpose (see Polishing and Dye Give Brewery Floor Historic Character). 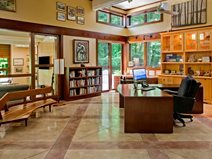 More people want the concrete in and around their homes to reflect the surrounding environment by incorporating themes inspired by the natural landscape. 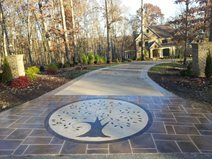 On this project, a decorative overlay with an engraved tree motif was installed over an existing concrete driveway to enhance a wooded estate. Another example of a project incorporating elements from nature is this concrete kitchen island, installed in a home in the Pacific Northwest. To create the effect of a flowing river and a wave-washed beach, the island was enhanced with many natural embeds, including exposed sand, rock, and petrified wood. 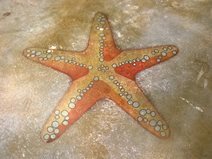 Decorative metallic coatings are a popular way to dress up concrete floors (see Adding Dazzle with Metallic Coatings). 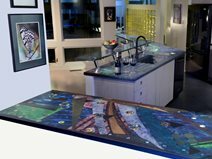 But now contractors are discovering that they can apply these same coatings to concrete countertops, vanities, and even sinks to add some glitz and glamour. On this project, Olvin Espinosa of Concrete Decor Studio applied a silver metallic coating to a master bathroom sink and vanity with very successful results. 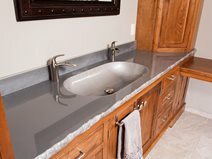 See Metallic Finish Enhances a Concrete Sink. Decorative concrete contractors can achieve incredible results when they work solo, but even the most skilled contractors will admit that the outcome often improves when they collaborate with professional designers and artists. We're seeing more contractors taking that teamwork approach, resulting in such success stories as a stamped concrete patio that works beautifully with a formal landscape design (see Formal Patio Showcases the Beauty of Natural Gray) and a concrete countertop showcasing the staining mastery of a celebrated artist (see Concrete Countertops Become an Artist's Canvas). Remember the popular grade school art project, where you wrapped string around an air-filled balloon and then popped the balloon after coating the string with glue? Well, that’s similar to the effect you can achieve with fabric forming. Wet concrete is cast against flexible formliners made of plastic sheeting or fabric to create interesting shapes and textures that remain after the forms are removed. Fabric-cast concrete is often distinguished by soft curves and organic surfaces, bringing unique beauty to architectural concrete. See this example: Making Waves In a Concrete Wall.